Florida Survival Gardening: Is it just me... or is the Weather Channel getting dumber? Is it just me... or is the Weather Channel getting dumber? "His Head Went Out The Plane" and "The Road Is Covered in... AAHHH!" both sound like they came right out of Idiocracy. I know what you're thinking. You're thinking, "Why does David visit weather.com for his weather reports?" My response would be, "Because I like to check multiple sources. Plus, 'weather dot com' is easy to remember." And... I really want to know "19 Things Your Bikini WON'T Save You From" and learn more about why "Scientists Call It The Sock Monster," not to mention discovering why "You Won't Believe What Was Found In His Earlobe!" I hear ya David. I've noticed that they run these revolving door headlines baiting me to click on an article. Some headlines are quite intriguing. I have taken the bait a time or two. It takes awhile (relatively) to load their page it's so loaded down with semi-related and totally unrelated stuff. I now use weather underground (but they have some dumb ads like "how to get rid of belly fat", come on people). They have local unmanned weather stations that pick up conditions in my area. I think weather bug does that too, but we've had problems in the past with their page being loaded up with too much stuff. It's seems we can't escape the garbage I'm sorry to say, except to completely unplug. I just let myself be suckered in yesterday: "He left her to die"
The thing that really irritates me (feel free to use a more pungent expression there) is all the ads that don't tell you the answer to the tease until you've watched at least 20 minutes of high-pressure sales that won't let you out of the thing before it's finished. I'm still mildly curious about what Ellen has been hiding, but I've resigned myself to never knowing. "Power companies hate him!!! Check out this crazy home energy secret discovered by a dad." I was just saying to hubbie last week I give up on weather.com and will start using weather underground (http://wunderground.com). 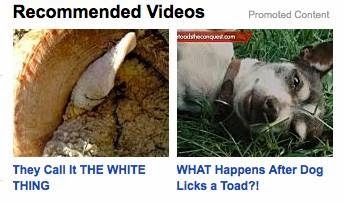 Weather.com has become a tabloid site!! Another site I like is AccuWeather. They do have some of the tacky ads, but at least they are not at the top of the page. And their video links are actually weather-related.